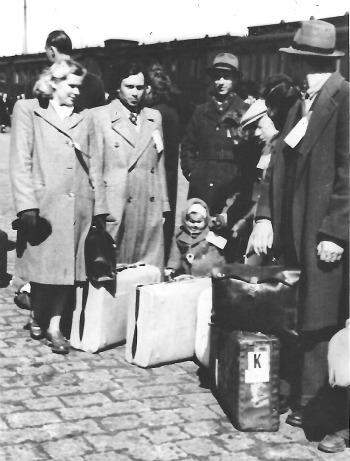 This week, I was rereading some of the letters my mother, Mathilda Gruber Conan, wrote when we lived in Germany after World War II and my father was involved in resettling concentration camp survivors. The war had been over for several years but thousands of them awaited the opportunity to settle somewhere permanently. I told a story about this yesterday at the Living Arts Playback Theater program on Immigrant Stories. Here is a letter she wrote to her sister Clara in the Bronx. “Last week when we went to Hamburg to see a d.p. (displaced persons) boat off for the States, I got into conversations with some of the people and told them what a fine country they were going to. You should see some of the d.p.’s. When you go home, you want to kiss every morsel of food, every stitch of clothing, every small conform. Mature people, working and living out all their lives, all they have to show for it is a measly bundle or two, a dilapidated valise, some crazy collection of clothing on their backs. True, some have good luggage and are well-dressed (relatives from the States send them things), but most of them are sponsored by agencies, know no one in the States, are just going to take jobs and try to build a new life. Naturally, they’re scared and have misgivings, but I told them that no matter how hard they work, they’ll be free and they’ll be able to enjoy whatever little they have. Free education for their children. They couldn’t believe it. Some of them take the orientation course while they’re in camp…interpreters help them to understand, but not all of them turn up. Some of them are just too weary, or have to watch their many children. The world of the d.p. is unlike anything you’ve ever heard of. It’s not like any settled community, however poor or unyielding. When people are not fixed, when they shift from one camp to another, waiting frenziedly and impatiently to go to Camp Grohn …for final clearance, they can’t ever establish even temporary roots. They mill around aimlessly….Their main preoccupation is moving off, getting cleared, sailing. Read more of Mathilda Gruber’s letters and other blogs about post-war memories.